It’s been few days and the word “Zzungry” is raving everywhere. I have seen so many positive reviews, pictures and discussions about this new food tech startup in Bangalore. Any new fish into sea creates some hype initially. However, in the case of Zzungry the word of mouth never stopped. I was totally shocked to see such a great response in the Social Media & Foodie groups. Well, one fine day I decided & placed an order at www.zzungry.com. Since I stay far from the Zzungry deliver radius, so thought of picking up from the place where they can deliver maximum up to. They were very courteous & patient, when I told them about the consequence and they agreed to deliver till Silk Board. If the first impression is good, then I was sure food will not disappoint me. I also told my co-workers about Zzungry, so they were eagerly waiting for the lunch. The Zzungry folks immediately shared the delivery person’s phone number, so I did not find any difficulty in picking up my lunch. The process went smoothly without any hassles and I was happy. We ordered so many varieties of Vegetarian dishes like Tandoori Malai Broccoli, Muhambra Paneer Tikka, Paneer Awadhi, Methi Mava Matar, Jaipuri Missi Roti, Pudina Lachha Paratha, Phulka E-Shabeena, Kashmiri Pulao and Chena Makhana Sangam. There are Combos as well. However, we opted for Ala-Carte! Tandoori Malai Broccoli (Starter) – The dish was tossed perfectly with mild flavors and tasted divine because of the cheese & cream. The dish was fresh although we had after 30 minutes. Muhambra Paneer Tikka (Starter) – I was wondering what could be the special flavor added to this Paneer Tikka while placing an order. The dish has an exotic pepper & cashew flavor. The dish will leave your tongue longing for more. Mughalai Bharwa Aloo – This was a stuffing of Paneer & Dry Fruits. The dish was perfectly marinated & prepared in the Tandoor Oven I guess. A must try starter for a Vegetarian. Paneer Awadhi – Since I am lover of Awadhi food, so I have a basic knowledge of the ingredients used in preparing the dishes. 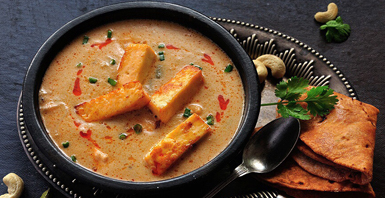 Well, Paneer Awadhi is one of the royal dishes and every Paneer cube was perfectly marinated in the spices. The gravy was thick, flavorful, delicious & lip-smacking. MethiMavaMatar – All I know about Methi Malai Matar was from one of the nearby restaurants. The dish “MethiMavaMatar” took me out of the world. The dish had a good texture and tasted great. Phulka E-Shabeena – Two different colors like Orange & Green Color phulka kind of roti’s with decent flavors & goes perfectly with both the curries. Kashmiri Pulao – The Pulao was aromatic, mild & sweet. Being a spice food lover, I don’t want to comment on it. It would be a good idea, if they can substitute with some Peas Pulao or Biryani along with this dish because everyone might not like Kashmiri Pulao. Chena MakhanaSangam – A dish made with Chenna & Puffed lotus seeds and garnished with Saffron. The dessert looked great & charming. I liked the dish since it wasn’t too sweetish. I am pretty sure that these dishes will not be available in either other food delivery companies or other restaurants unless it is a Five Star. I haven’t heard or seen these dishes (except Kashmiri Pulao) till I ordered food from Zzungry. There are so many food tech startups in Bangalore now. However, the Zzungry food category is completely different and unmatchable. The Philosophy of the “Zzungry” is simple, in 5-star hotels we end up paying more for the ambiance rather than the food. Instead, they want people to pay ‘just’ for the premium quality of food. The “Zzungry” is delivering food around HSR Layout & Indiranagar Localities. I heard that, they are soon coming to few other localities of Bangalore. Overall experience was impeccable & appealing to order again! Next Post 67 Years Old Restaurant arrived to Namma Bengaluru – Pindi Bangalore, HSR Layout, Bangalore.